Beside the start of the Green Canal a significant inlet cascades down an impressive high aven that rises well above the height of Cloud Chamber. 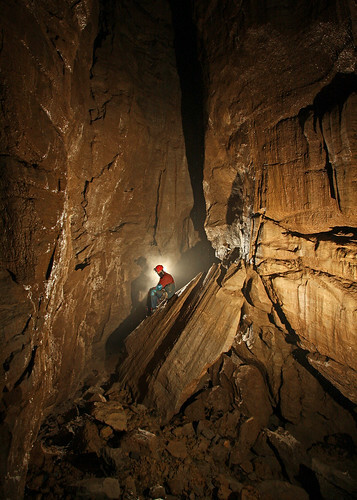 This was climbed by the original cave explorers to find the stream issuing from an impenetrable bedding plane. Above this bedding plane are layers of lower quality limestone, in which it was thought that no significant cave would form. 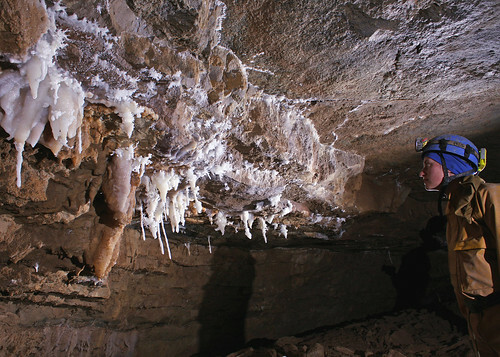 This high level area of the cave was therefore left unexplored until two years ago Richard Frost, a local caver with a great aptitude for climbing, decided to take a second look. After re-climbing the aven at the top of the cascade Richard found that it would be possible to clear enough silt from the bedding plane to make it negotiable by the slimmer caver. 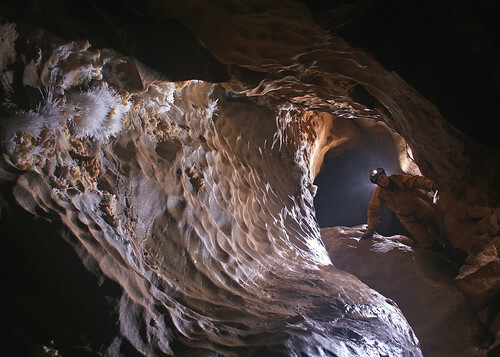 Several digging trips allowed the bedding plane to be passed to find a boulder choke that led into the bottom of an impressive chamber, and so the Cascade Aven Series was discovered. Richard had invited Brendan to photograph these passages and was joined by Chris to explore these extensions to Dan Yr Ogof. Unusually for a trip in Wales we packed our SRT kits and met Richard on the DYO car park at lunchtime, after he had finished a shift at work. Richard took a body sized tackle bag out of his van and packed the camera box in it along with his SRT kit, ladder etc, which left Chris and Brendan to just take in personal SRT kits. 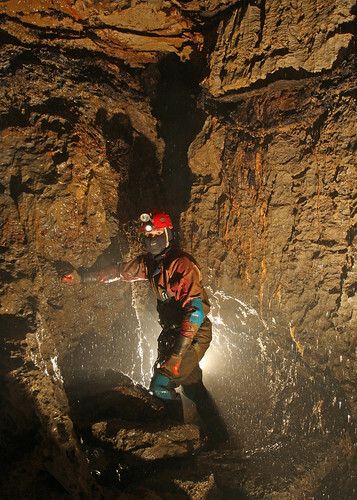 Water was very low in the cave after a long period without rain, and we made fast progress to Cloud Chamber, picking up ropes and digging equipment on the way in. We kitted up in SRT gear, and then made our way to the bottom of the cascade, which Richard free-climbed, taking a rope with him. This rope was then rigged down the cascade to act as a handline for Chris and myself to make the ascent. At the top of the cascade you find yourself at the bottom of an aven with the spray of the stream showering down on you. A prussik up the 30 foot pitch brought us to a ledge where the stream issued from a low bedding plane. A flat out wriggle ensued through the duck to follow the bedding plane, the water soon became less deep, but the flat out crawl contained lots of silt and gravel. This in many ways reminded me of Redhouse Lane Swallet, as we pushed the gravel to the sides of the passage to make progress. Once through the bedding crawl an interesting maneuver was required to pass a hairpin bend that led into the bottom of the boulder choke. Emerging from the choke we found ourselves in an impressive tall chamber, perhaps 30m high in places. Richard Frost in the chamber at the bottom of the second pitch. 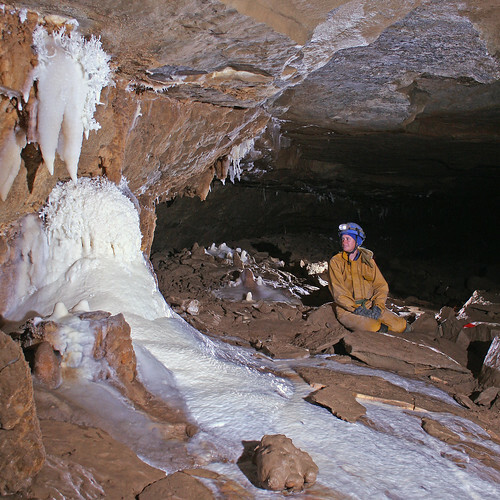 Richard Frost on a large fallen slab that dominates this chamber. Chris Webb watching Richard Frost ascend the second pitch. 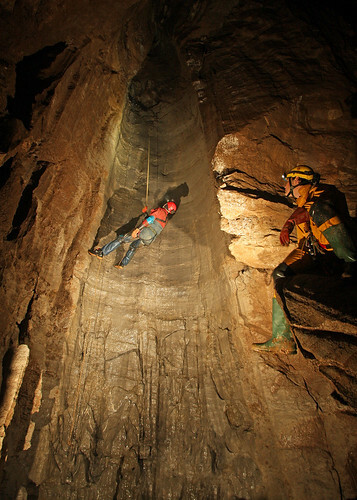 Photos were taken in this area before we made our way up the second pitch that drops into the far end of the chamber. At the top of this pitch, the water issues from a tight rift making getting off the rope a little tricky. Once clear of the pitch head the stream was followed to a short free-climb into a small chamber at the bottom of the third pitch. Richard makes his way to the bottom of the third pitch. This short pitch was up sharp and loose rock and entered an area of very loose rocks. In this area of the cave there are a multitude of passages leading to loose avens and another short pitch upwards. We spent a little time exploring an unfinished lead that ran off from the final aven. After several minutes of attacking a tight squeeze with a lump hammer, Brendan managed to squeeze through to enter a tall rift chamber. Richard then came through to climb the rift, only to find it closed down too tight at the top. With another lead closed down, we made our exit from the cave. Jess and Mark had just been on an srt course and fancied a nice srt trip, and beings it had been some time since i had done any srt, i decided a trip to Oxlow would be a baptism of fire for the pair of them. So with me leading the way and rigging with some dubious looking knots (you forget if you don't tie them regular) and the rest of the party laughing as i try to reach the deviation on the third pitch slow but steady progress was made to the bottom of Oxlow , i drew the line at dropping into the lake at the bottom as i didn't really fancy getting my feet wet, and neither did any body else. On the way out Mark was "volunteered" to do the d-rigging which he coped with really well-now we had the common sense to take an extra tackle bag in with us (empty) as the rope becomes really heavy when wet, and you can struggle on the pitches on the way out, so we shared the ropes using the extra bag to ease the burden, and guess what ,when we got out the sun was shinning. Daren Cilau has a fearsome reputation due to the long tight entrance crawl which puts off a lot of people from visiting. In actual fact, although there are a few squeezes in it, and you do get a little wet lying in the small streamway, the crawl can be completed in a reasonable time, and beyond lies an immense system to explore. The plan for the day was to enter via the crawl, take some photos of the formations in Epocalypse passage and then exit via Price's Dig (Ogof Cnwc). We had previously attempted to visit the formations via Price's Dig, soon after the connection had been made, and knew that this route is no quick alternative to visiting via the main entrance, and so had an expectation of a reasonable trip. The day started with our obligatory breakfast in Luigi's Cafe before heading up to Whitewalls to change and set off for Daren Cilau. Out popped Keith's Peli case containing the video camera an lighting, not to be outdone, Brendan takes out his larger Peli case with the stills camera in. At this point we are both trumped by Richard with his super size case containing camera in an underwater housing and underwater flash unit. Once at the cave, the first challenge of the day was to negotiate the entrance series with the camera boxes. Taking a steady pace, we made our way with no incidents, and the dry weather had ensured that we avoided the unpleasant dousing at the "Trickle in the Ear" squeeze. Rachel finally at the end of the Entrance Crawl. A couple of photos were taken on route to the Big Chamber Nowhere Near the Entrance, where we signed in and made our way up the boulder slope to the low arch that leads to the start of Epocalyspe Passage. Easy progress was made viewing the many selenite crystals and needles as we went along. Soon we arrived at the White Company formations, the camera boxes were broken open and the passage illuminated with a multitude of flashes, until mutiny broke out amongst the models and we progressed to the spectacular Urchin Oxbow. Rachel viewing the White Company formations. Urchin Oxbow is a fantastically scalloped passage with some of the finest clusters of aragonite needle clusters in the cave and makes an interesting detour on a trip into the cave. We spent some time taking photos of the passage and the formations, before making our way towards Antler Passage and the helictite formations that lend their name to the passage. Rachel near the end of Urchin Oxbow. An "arty" photo of Rachel in Urchin Oxbow. From the start of Antler Passage a climb up and then another down leads to an area with a great view of the Antler formations. Photos were taken before we packed the camera gear away for good and started the journey up Antler Passage to Busman's Holiday, Price's Prophecy and the connection to Ogof Cnwc. 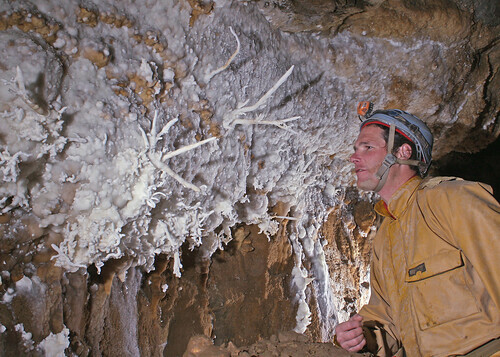 Richard viewing the Antler helictite formations. Antler Passage is quite taxing to progress along as every hundred metres or so, you encounter a pile of rock that has peeled away from the wall, which you have to climb up, go over the top and then climb down at the other side. The first of these muddy climbs is quite tricky and now has an impressive home made rope ladder on it, that takes you up to a traverse at roof level that leads to "Man in the Roof" and also then drops back into Antler Passage. Climbing up and down becomes quite monotonous, some of the climbs are quite exposed and the muddy handlines are not as much help as they could be. Eventually the climb up into a boulder choke leads into Busman's Holiday, some large boulder strewn passages, connected by an unpleasant flat out crawl over mud and rocks. This marks the end to the unpleasant part of the trip as you now head to Price's Prophecy and the connection to Ogof Cnwc. A dug out bypass to the original sump brings you out half way up a scaffolded shaft, which can be climbed to reach a hands an knees muddy crawl. Soon you meet a small calcited chamber at the top of which is a flat crawl that leads to the logbook and to the gated entrance. Antler Passage is quite unpleasant, the original entrance for all its faults is the most direct, most pleasant and fastest way in and out of the system. 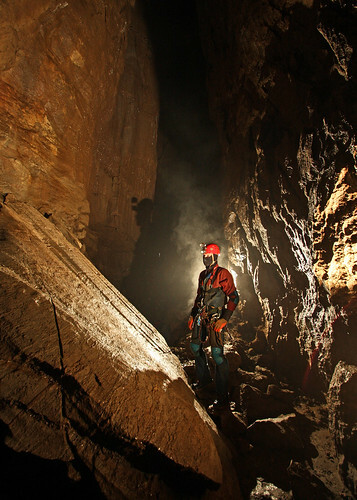 A regular event on the SWCC caving calendar has been an expedition to the Toledo area in the south of Belize in Central America. 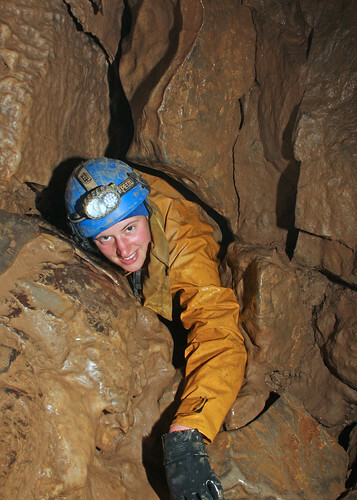 This biennial event produced a good deal of new cave in the previous trip in 2008 and a number of very good leads had been found to set the 2010 trip up with some great prospects. Conditions on the previous expeditions were very basic to say the least, with poor food sapping both the enthusiasm and energy of the group as the stay progressed. Fortunately we had struck up a great relationship with a local tour guide and lodge owner - Bruno Kuppinger. This provided us with a fantastic base for the expedition and ensured that we had ample quality food to keep the team going through the three weeks. Pueblo Creek cave was one of the key leads to be followed up, this had been discovered in 2006 and explored to a large log jam, that halted progress that year. In 2008 the obstacle had largely been washed away and progress was made through the large river system, only stopping when we ran out of time. This year we were able to follow the cave to a final conclusion, a massive sump 60m wide and a 30m swim to where the roof finally met the water. Above this sump a large oxbow passage rose steeply to meet the main river passage close to our final exploration point of 2008. This massive oxbow passage contained a fantastic pagoda formation over 10m tall. A stream inlet passage that had marked the end of the cave in 2008 was explored over a couple of days, being surveyed for over 700m to a point where it ended in a small sump. A second entrance with some Mayan pottery near the entrance was surveyed on our final day there leaving the cave at a total length of 4.8km. Our exploration moved to the other side of the mountain range into which Pueblo Creek headed looking for the resurgence of this large river system. 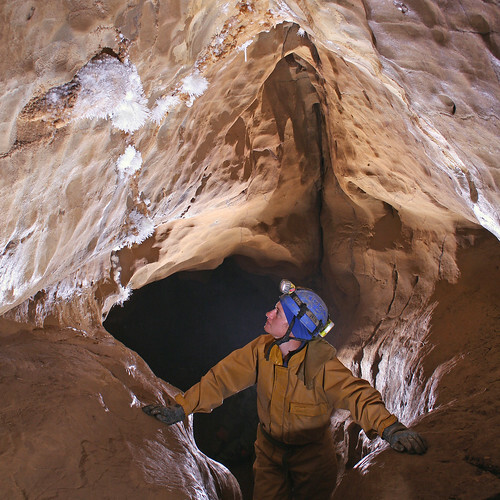 A cave called Ochapec previously explored by an American team was entered and immediately it had the same feel as the lower section of Pueblo Creek. This was followed for about 1.5km to find it ending at a sump pool, 60m wide and a 30m swim to where the roof reached the water, stunningly similar to the sump at the end of Pueblo Creek. To tie in the cave a line survey was taken on the way out, which when plotted in survex alongside Pueblo Creek place the two sumps 390m apart. No dry level leads could be found at either sump, so no through trip was possible. Tiger cave near San Miguel had been visited over a number of expeditions, each time new passage being found, surveyed and added to the original American survey. Most of this passage has been lower level streamways, now more accessible now that a nearby Hydro electric plant has diverted some of the water flow. At the end of the expedition a new entrance and another 700m of passage had been surveyed, leaving this cave over 5km long. Another area potentially containing a large river cave is in an area called Esperanza, over a days hike into the Jungle. This is a difficult area for exploration due to the large amount of equipment, food and water that needs to be carried into the jungle. In the last expedition, a hike to towards this area had found a cave called Lagonita that was surveyed for 200m to a short pitch into a long deep canal. Lack of equipment had meant that exploration ended at this point. A group headed into the Jungle this year with the aim of fully exploring this cave en-route to Esperanza. 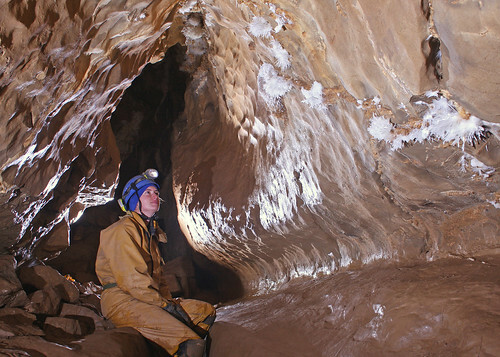 The cave yielded another 70m of surveyed passage, before it ended in a chamber with the water rising through a grit covered floor. As the guides had no prospective leads at Esperanza the group decided to follow them to a cave known by Ramone, one of the guides. 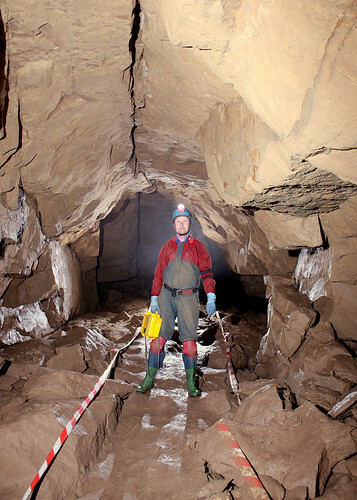 This fossil cave was followed a short distance until it closed down, a rough survey was made on the way out. It was during this process that two small passages were noticed and followed, One led into a massive upper gallery, while the other dropped down a pitch into a massive streamway, which could be followed upstream and down. This very exciting lead will provide the main target for a return expedition to this area.